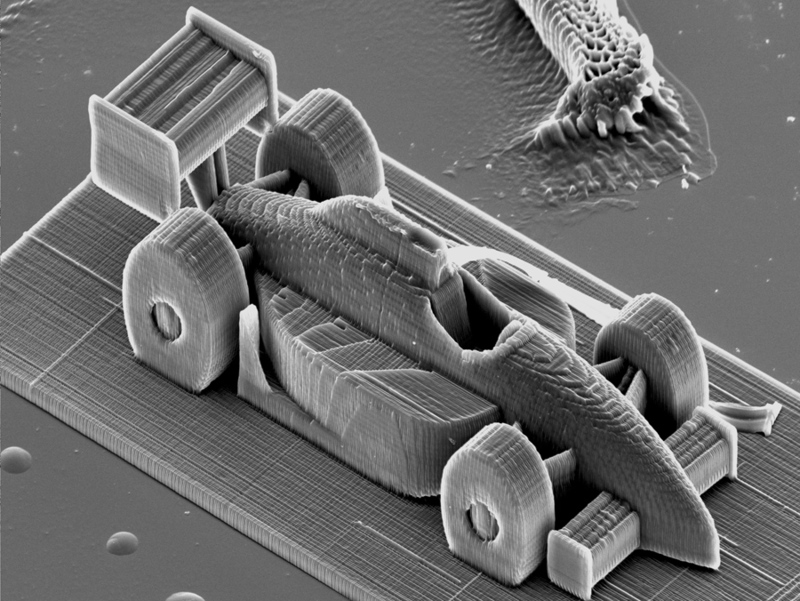 Printing three dimensional objects with very fine details using two-photon lithography can now be achieved orders of magnitude faster than similar devices in a breakthrough by Vienna University of Technology (TU Vienna) researchers. The 3D printing process uses a liquid resin, which is hardened at precisely the correct spots by a focused laser beam. The focal point of the laser beam is guided through the resin by movable mirrors and leaves behind a hardened line of solid polymer a few hundred nanometers wide. This fine resolution enables the creation of intricately structured sculptures as tiny as a grain of sand. “Until now, this technique used to be quite slow”, says Professor Jürgen Stampfl from the Institute of Materials Science and Technology at the TU Vienna. “The printing speed used to be measured in millimeters per second — our device can do five meters in one second.” In two-photon lithography, this is a world record. This progress was made possible by combining several new ideas. “It was crucial to improve the steering mechanism of the mirrors,” says Jan Torgersen (TU Vienna). The mirrors are continuously in motion during the printing process. The acceleration and deceleration-periods have to be tuned very precisely to achieve high-resolution results at a record-breaking speed. “The resin contains molecules, activated by the laser light. They induce a chain reaction in other components of the resin, monomers, and turn them into a solid,” says Torgersen. These initiator molecules are only activated if they absorb two photons of the laser beam at once, and this only happens in the very center of the laser beam, where the intensity is highest. In contrast to conventional 3D-printing techniques, solid material can be created anywhere within the liquid resin rather than on top of the previously created layer only. So the working surface does not have to be specially prepared before the next layer can be produced (see video), which saves a lot of time. At the TU Vienna, scientists are now developing biocompatible resins for medical applications. They can be used to create scaffolds to which living cells can attach themselves facilitating the systematic creation of biological tissues. The 3d printer could also be used to create tailor made construction parts for biomedical technology or nanotechnology.